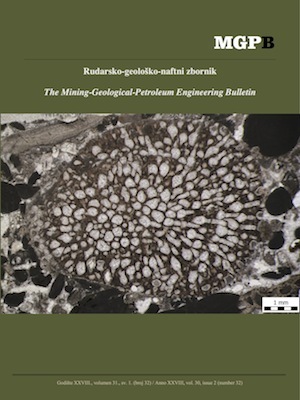 Composition and provenance of Gröden sandstone from the Velebit Mts. Six samples of Gröden sandstones (Middle Permian) were analysed: Five of them were from Pikovac Creek valley (in the vicinity of Brušane village at Velebit Mts., Croatia) and one was from the locus typicus Gröden/Val Gardena (Italy). Based on the micropetrographical characteristics of sandstones, as well as on the modal composition and heavy mineral association, origin of material, weathering index of source rocks, climate and relief in the period of deposition have been supposed. Four samples from Pikovac Creek were petrographicaly determined as lithic greywackes, one as densely packed lithic arenite, while a specimen from Gröden locus typicus represents feldspar greywacke. Lithic greywackes/arenites imply very low maturity and suggest a close proximity of source rocks as well as the active tectonics in the hinterland of the depositional basin. Heavy mineral association in the samples from Pikovac Creek valley, with a large amount of fairly rounded stable grains (zircon, tourmaline and rutile), indicate that clastic material was derived from recycled orogen, and probably from reworked sedimentary rocks. The presence of kyanite and chlorite in the heavy mineral assemblage suggest their origin is from metamorphic rocks. This data assumes that Gröden sandstones from Pikovac Creek were possibly deposited in the fan delta or braided delta depositional environment as a part of a rift system (recycled orogen). The composition of the sample Gröden s. locus typicus (light and heavy mineral fractions) suggests the vicinity of magmatic rocks in the source area. All analysed samples are red coloured and have a large amount of limonitized grains in the heavy mineral assemblage, that point to the arid climate at the time of deposition. A weathering index diagram for Pikovac sandstones implies an arid/semiarid climate and high relief of the source area where metamorphic or sedimentary rocks dominate, while an arid/semiarid climate and high relief with plutonic source rocks were supposed for the provenance of Gröden s. locus typicus. You read the ethical codex of the RGN zbornik available at journal web. You submitted work is your original work, and has not previously been published and does not include any form of plagiarism. You own copyright in the submitted work, and are therefore permitted to assign the licence to publish to RGN zbornik. Your submitted work contains no violation of any existing copyright or other third party right or any material of an obscene, libellous or otherwise unlawful nature. You have obtained permission for and acknowledged the source of any illustrations, diagrams or other material included in the work of which you are not the copyright owner. You have taken due care to ensure the accuracy of the work, and that, to the best of your knowledge, there are no false statements made within it. All co-authors of this submitted work are aware of, and in agreement with, the terms of this licence and that the submitted manuscript has been approved by these authors. The original author must always be given credit. The work may not be used for commercial purposes. If the work is altered, transformed, or built upon, the resulting work may only be distributed under a licence identical to this one. In addition to publishing the work printed under the above licence, RGN zbornik will also enable the work to be visible online. The journal editorial can change the licence rules anytime but it cannot retroactively restrict author(s) rights.